In Michael Eric Dyson’s takedown for the New Republic of his friend and mentor Cornel West, he has a come-to-Jesus moment that is neither pretty nor kind, but painfully blunt. The realization comes to Dyson that West is a parody of the intellectual he once was, that his vicious and often personal attacks on President Barack Obama have come at a cost: the loss of his credibility. And the loss of their 35-year friendship. Dyson’s story, “The Ghost of Cornel West,” is a tale of transgressions, verbal and personal, of bruised egos and hurt feelings, of a father figure lashing out at the perceived ease of youth and the successes of those for whom he laid a path. It is a work of loss that is also an unmasking. For Georgetown professor Dyson, West—once an emperor among his peers—no longer wears his scholarly clothes, but can still evoke the phrases and popularized passages that remind you of who he once was. Yes, Dyson affirms in his piece that West is brilliant. Yes, West is smart. Yes, West is one of the premier intellectuals on the intersection of race and philosophy of his time. But yes, West is mortal, passive-aggressive, jealous and petty. Dyson spoke with The Root Sunday about his piece and why he wrote it. West’s ever personal turn has “obscured the sometimes powerful and sometimes luminous and other times legitimate critique” he may have, according to Dyson. “But when you weight it down under the burden of extraordinary, personal bitterness, it just wipes away all the good stuff that you might say and makes us question what it is about the motivation for your criticism in the long run,” he said. Dyson is talking about both West’s critique of Obama and of the scholar’s attacks on Dyson and his peers, both older and younger, primarily Melissa Harris-Perry, Al Sharpton and Jesse Jackson. West has called them all traitors of sorts, liars and opportunists who choose to toe the Obama administration line. This despite the fact that all have been critical of President Obama at one point or another but have couched their criticism with respect for both the office and the place President Obama holds in the hearts of many African Americans. West, who has compared himself to slain civil rights icon Martin Luther King Jr., has called them “false prophets,” leading with the idea that his voice is the only one ringing with any truth. Yet, for Dyson, there is something very unlike MLK about this assessment. “Martin Luther King never talked about people he disagreed with in the way West has talked about me or Melissa or Jackson or Obama. Martin Luther King didn't even call the white racists he disagreed with those kind of names,” Dyson said. Still, their “respect” was viewed as capitulation by West. As Dyson points out in the piece, West at one point was an Obama surrogate during the 2007-2008 presidential campaign, but the relationship turned sour when West felt Obama disrespected him. Much was made of his interview with Truthdig in which the scholar griped about not receiving inauguration tickets. In his story, Dyson paints West as a hypocrite. One who blasts his contemporaries for their love of cameras, power and celebrities, when he has courted and desired all the same things openly. That West gushed over meeting the same President Bill Clinton that he bludgeons Obama with, by calling the president a “brown” Clinton. (“I think that he didn't feel dissed by Clinton the way he felt dissed by Obama, that personal element. Again, we have to reduce it to the personal. Maybe Clinton didn't stiff him on inauguration tickets,” said Dyson.) He also pounces on West’s tendency to call himself a prophet and compare himself to King and Jesus Christ, while lacking the wherewithal to put those words on the line and be held accountable. Is West upset that his place—or his perceived place—in the hearts and minds of African Americans was supplanted by Obama? Dyson doesn’t think West’s ego is that huge to believe he could box with the place in history Obama earned. But the deeply personal nature of his attacks seems to hint that something is amiss, he says. “It would take an egomaniac to believe that you had a chance first of all. That it's a competition. To think that you're in competition with him to begin with is ridiculous,” Dyson said. “There was no choice for black people to have. It was Obama versus anybody else. It was Obama against the rest of the world. Whether it was Jeremiah Wright. Or Jesse Jackson. 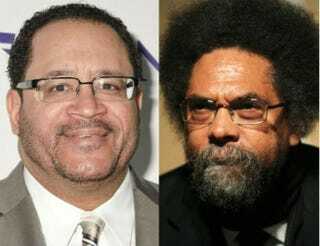 Or Cornel West or Tavis Smiley. “They would all be casualties in the war for respect and representation of the president of the United States of America, the first black man to get in the office,” he continued. “We’ve had a plethora of prophets. We’ve had endless black intellectuals. We ain’t had but one black president. So first of all, you’re not going to win that battle. All of this has left Dyson wondering if West was ever happy for anyone’s success—Obama’s or otherwise. On a personal note, Dyson’s has made a name for himself under the mentorship of West. But with each success Dyson mounted, he says, there seemed to be a simmering passive-aggressiveness from West. During his interview with The Root, Dyson recalled a time earlier in his career when a weekly Philadelphia newspaper was doing a cover story on him and he asked if West would contribute to the story, which was bound to have critical momentum. He was hoping for words of encouragement and positivity from a peer, but what he got was backhanded compliments and criticism. When Dyson confronted West, he said the professor told him no one was above criticism. But the hurt was real. They were friends. Dyson said he didn’t do that to West when people asked about the much-maligned spoken word albums he produced. Incidents like this stuck out to Dyson and made him question things, but it wasn’t until West’s attacks on Dyson over Obama became commonplace that he wondered what West actually thought of him and their friendship?